Edward Wilson, An Ice Berg off Cape Evans Sept. 1.11 4.30pm 1911. Collection of Sarjeant Gallery Te Whare o Rehua Whanganui. Early in the twentieth century Antarctica was the last unexplored continent. 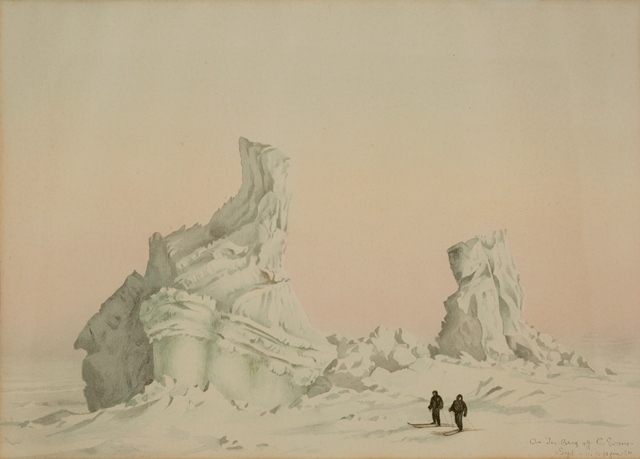 English physician, natural historian, ornithologist, naturalist and artist Dr Edward Wilson was in the vanguard of its exploration being on both of Robert Falcon Scott’s expeditions ‘Discovery’ and ‘Terra Nova’. On ‘Terra Nova’ Wilson made his most well-known watercolours of an unforgiving wilderness that only a handful of men had seen before. The Sarjeant holds fifteen lithograph prints of these watercolours in its collection with this work being one of them. They weren’t easily made – with his preference for making work in the field he was unable to use his watercolours, as they froze, so he would make notes on his drawings of what colours to use then would paint back in the warmth of the hut. Wilson believed himself an amateur but was renowned for his accuracy and he is remembered as one of the last major expedition artists. ‘Terra Nova’ was a turning point, as he was accompanied by one of the first great expedition photographers, Herbert Ponting. Recording science and exploration from then on passed primarily to photography. Foremost a scientist, Wilson was chief of the scientific staff and had an unusual plan for winter, a 200 km journey to secure newly laid Emperor penguin eggs. Wrongly believed to be a primitive form of bird, it was thought the study of these eggs would reveal the missing link between dinosaurs and birds. The embryo was suspected to have scales or some other “dinosauresque” feature. This was deemed as important as the trips other goal of being first to reach the South Pole, it would prove false and the link would be found elsewhere much later in the century. The five weeks it took were worse than Wilson could’ve imagined, Wilson and two others travelled in darkness well below freezing, once recorded at -59C, so cold it froze pus in their frostbite and cracked their teeth. They briefly lost their tent and when they got back they had to be cut from their clothing, one of the men described it in his memoir ‘The Worst Journey in the World’. A worse journey awaited Wilson, he was one of the five men including Scott to reach the South Pole and discover they had been beaten by Norwegian Roald Amundsen. From there they were doomed; the return journey had an inescapable outcome, mostly due to the weather. Evans perished first then famously in a vain attempt to save the others, Oates walked out of the tent with the parting words “I am just going outside and may be some time”. Wilson, Scott and Bowers were stopped by another blizzard, too weak to continue they died in their tent. The camp was discovered the following spring. Wilson was found frozen in his sleeping bag, Scott’s was open and he was partially out with his left arm over Wilson. “Words must always fail me when I talk of Bill Wilson. I believe he really is the finest character I ever met.” Robert Falcon Scott.